There have been no shortage of black bear sightings throughout the area of late. Nearly all, though, have come during the day. But this weekend, we have received word of a bear who's a real night owl - so to speak. A family in Dutchess County tells us the bear has made back-to-back evening visits the last two days. The bear must have felt at home because it came by again last night, Friday, Oct. 5. 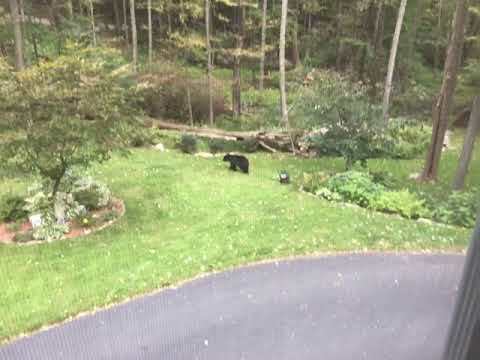 Stormville is about seven miles due north of Kent, where last weekend a large black bear interrupted family members as they were fertilizing their lawn in Putnam County. After taking cover inside their home on North Knapp Court, they watched and took the above videos (see the third, fourth and fifth images above). 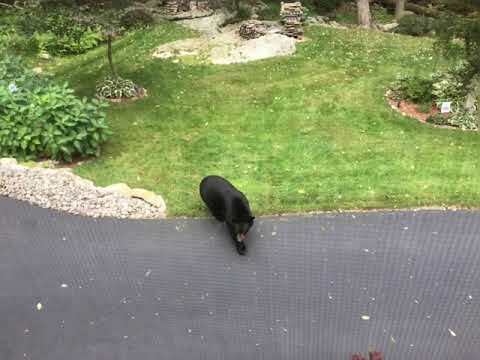 Before retreating back into the woods, the bear knocked over a wheelbarrow and helped itself to a 40-pound bag of fertilizer, which it carried in its mouth as it made its exit. It was the second bear sighting reported in Northern Westchester/Putnam in as many days last weekend. 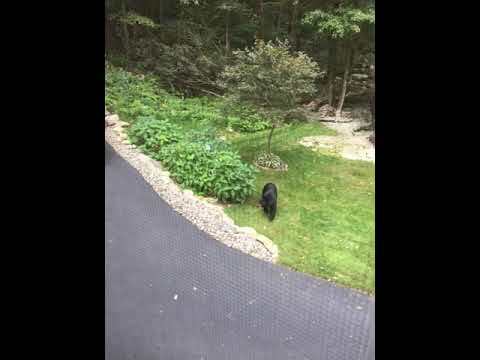 A day earlier, a bear was sighting along the Croton Dam Road and Pinesbridge Road corridors in Ossining, New Castle Police said. "If a bear is seen in your town or neighborhood, leave it alone. In most situations, if left alone and given an avenue for escape, the bear will usually wander back into more secluded areas," according to officials. "Keep dogs under control. Stay away from the bear and advise others to do the same. Do not approach the bear so as to take a photo or video. "Often a bear will climb a tree to avoid people. A crowd of bystanders will only stress the bear and also add the risk that the bear will be chased into traffic or the crowd of people."